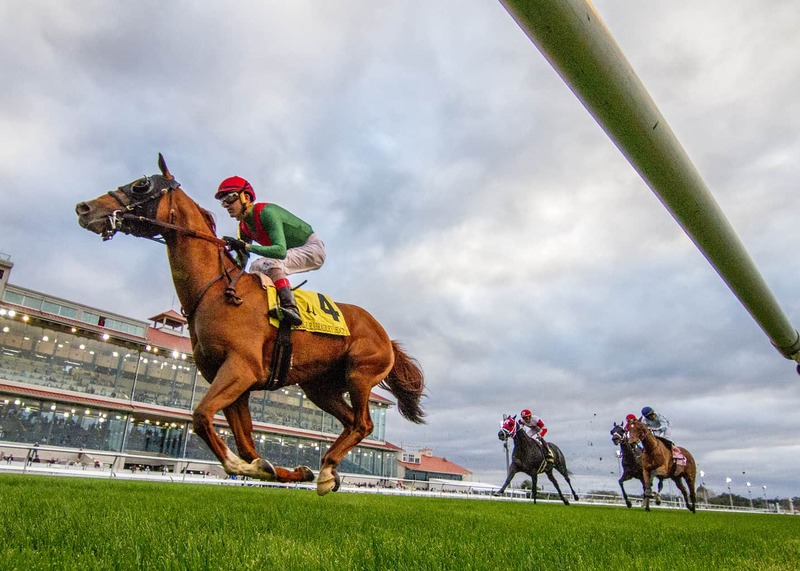 NEW ORLEANS, LA – Team Valor International’s First Premio finally broke through for his first career stakes score on Saturday, rallying in the stretch to take the $125,000 Colonel E. R. Bradley Handicap at Fair Grounds. Breaking from post 4 at 5/2 odds under Brian Hernandez, Jr., First Premio sat comfortably in the catbird seat while the 3/5 favorite Great Wide Open posted opening fractions of :22.52, :47.05, and 1:11.71. Rounding the far turn, First Premio moved out while looking for room, bumping with Sir Dudley Digges in the process. Undeterred, the Mark Casse trainee continued rallying strongly, taking command at the furlong marker before clearing away late. First Premio’s final margin of victory (3 1/4 lengths) came in a final time of 1:42.17 for the 1 1/16-mile event over the good turf course. Sir Dudley Digges rebounded after being bumped and fought hard to take second by a neck over a weakening Great Wide Open. Pioneer Spirit tired to fourth after chasing the early pace, while Teodoro never played a factor after breaking slowly and completed the order of finish. All Right, Big Changes, Silver Dust, and Team Colors were scratched. First Premio’s win came in his first start since last June’s Grade 2 King Edward Stakes at Woodbine, where he finished fifth. The 5-year-old son of Pure Prize improved his record to 12-5-3-1 with $230,768 in earnings. First Premio returned $7.20 to win, $4.20 to place, and $2.10 to show. Sir Dudley Digges brought back $5.80 to place and $2.40 to show, while Great Wide Open paid $2.10 to show.